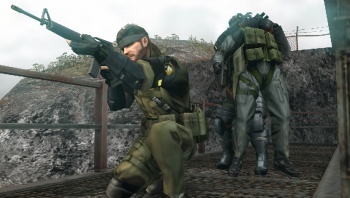 Could Metal Gear: Peace Walker See a PS3 Release? If you'd like to get your hands on Metal Gear Solid: Peace Walker but don't have a PSP, rumor has it that the game might see a PSN release as well. Despite the odd controversy here and there, Metal Gear Solid: Peace Walker is shaping up to be a handheld monster, garnering 40/40 in Famitsu and being called akin to the real MGS5. However, it's on the PSP - and while the PSP is certainly a popular system (especially in Japan), not everybody who has been a fan of the console Metal Gear games owns one. Konami is aware of this, reports GamePro, and may be considering releasing the game on PSN as well as on PSP. "So after I had done the [Peace Walker] preview, [Konami] had a Q/A session with us to get our complaints/ideas about the game," reports GamePro's Ben PerLee. "Other than the basics, they asked what we thought about if they released it on PSN for the PS3 as well and had online multiplayer." Is it a random, pie-in-the-sky focus group question? It certainly could be, and the fact that PerLee et al were asked it ultimately doesn't prove much ... but it does show that somebody at Konami has at least raised the idea. Would you play Peace Walker on PSN? Or do you think it belongs on its handheld home?